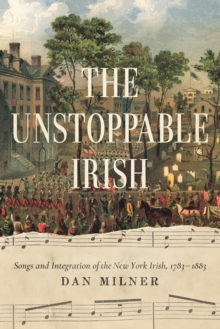 The Unstoppable Irish follows the changing fortunes of New York's Irish Catholics, commencing with the evacuation of British military forces in late 1783 and concluding one hundred years later with the completion of the initial term of the city's first Catholic mayor. During that century, Hibernians first coalesced and then rose in uneven progression from being a variously dismissed, despised, and feared foreign group to ultimately receiving de facto acceptance as constituent members of the city's population. Dan Milner presents evidence that the Catholic Irish of New York gradually integrated (came into common and equal membership) into the city populace rather than assimilated (adopted the culture of a larger host group). Assimilation had always been an option for Catholics, even in Ireland. In order to fit in, they needed only to adopt mainstream Anglo-Protestant identity. But the same virile strain within the Hibernian psyche that had overwhelmingly rejected the abandonment of Gaelic Catholic being in Ireland continued to hold forth in Manhattan and the community remained largely intact. A novel aspect of Milner's treatment is his use of song texts in combination with period news reports and existing scholarship to develop a fuller picture of the Catholic Irish struggle. Products of a highly verbal and passionately musical people, Irish folk and popular songs provide special insight into the popularly held attitudes and beliefs of the integration epoch.